Ultimately flexible and safe, the Ottocanali 1204 provides a wide range of system control and monitoring capabilities as well as sound shaping options, and a total of up to 1,280 W output power over 8 amplifier channels for Lo-Z or constant voltage systems, all neatly packed into a single rack unit: As ‘stand-alone’ in corporate board rooms, or along with Powersoft Duecanali models in the largest setups, the Ottocanali 1204 fits any venue. The Ottocanali 1204 offers unprecedented versatility and efficiency, also thanks to its very own set of BatFormers®. These are specifically developed, optional plug-in output transformers that can be easily installed through a dedicated lid in the amplifier chassis, and that allow the conversion of any – or all – of the 8 channels into a 70V or 100V constant voltage output. 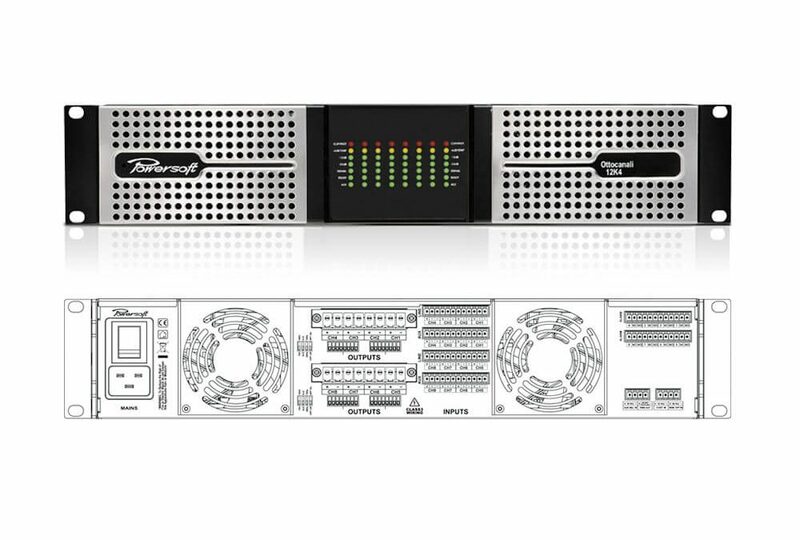 Another version, the Ottocanali 1204 DSP+ETH, includes DSP functionality for all 8 channels, paired with Ethernet connectivity for full control and monitoring through the Armonía Pro Audio Suite™, also compatible with all other Powersoft K, M, D, Q and particularly the Duecanali Series amplifiers (Interface available for MediaMatrix, Crestron, AMXcontrol, Q-SYS and monitoring systems).